If you are a beginner without a supervisor for your regime, try including walking, weight lifting and yoga in your regime. This combo is considered a balanced plan as it includes cardio, strength training and flexibility training respectively. There is no hard and fast rule to do cardio before muscle strengthening as it depends on the goal you set. Just make sure you get enough of both the exercises by the end of the week. Remember to do warm up exercises before and cool down exercises after your workout. A warm up prepares your muscles and helps prevent injury. 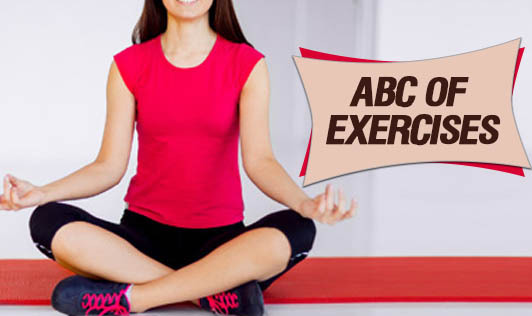 Cool down exercises help your body recover from the workout and also continues a low-intensity exercise session. Set a target of 50-85% of your heart rate while exercising to achieve maximum benefits. It is important to stay hydrated while exercising. Drink about 250-300mL of water every 20-30 minutes while exercising. A good way to strengthen and tone your muscles is by working your muscles to the point of tiredness. But remember to do it under a trained supervisor to avoid accidents. Spot reduction is a myth. Do activities for entire body to lose fat and weight from a specific area. Adding yoga for warm up or cool-down exercises can improve flexibility, strength and balance. Pick a time of day you can stick with. So it's time to start exercising and stay in shape!